I love extremes. They don’t happen very often, but when they do, we can make a lot of money. When everyone is firmly on one side of the boat, we want to be on the other side. That’s what’s going on with platinum today. The Commitment of Traders report shows that hedge funds hit a historic record. They are “short” platinum. That means they bet the price of platinum will go down. This is the most extreme position since we started keeping track back in the early ‘90s. We call the hedge funds the “dumb” money because they are the ones making bets. On the other side of this trade are the producers. They are the “smart” money. Now the dumb money is at a 25-year extreme … and we can profit from it. This shows how hated platinum is among hedge funds. Right now, all the funds are betting that the price will continue to fall. Here’s the thing: Platinum is cheap. 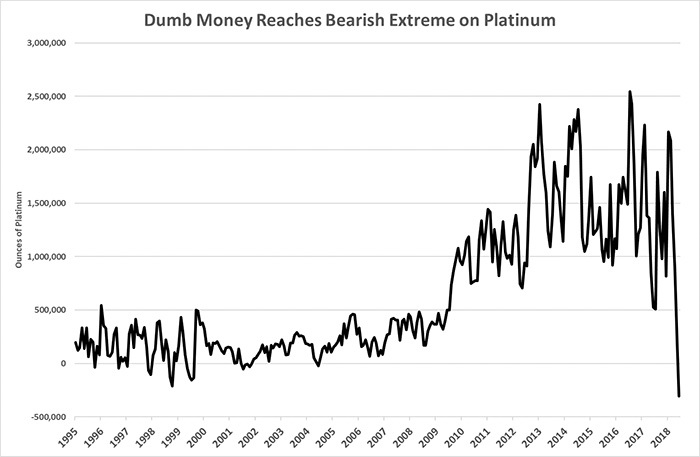 At the bottom in 2008, platinum hit a low of $934 per ounce. Today it’s $834 per ounce. Over the past 20 years, it took an average of 1.4 ounces of gold to buy one ounce of platinum. Today, that ratio reversed. An ounce of gold will buy 1.5 ounces of platinum. The hedge funds made about as much money from this trade as they can. Now they must unwind it. That means buying platinum … which means the price will rise. The way to make this trade is through the ETFS Physical Platinum Shares ETF (NYSE: PPLT) or the GraniteShares Platinum Shares ETF (NYSE: PLTM). Either one will let you profit as the hedge funds unwind this historic short position.